Yes! We’ve been waiting for this state ever since we came back from this state…ironically, 1 year ago. We discovered some of the best food on our 2017 California trip—Carnitas, guacamole, Mexican street corn, churros, and a Mexican breakfast buffet that nearly made Hubby wept tears of joy. With all those choices, how do we pick just one? 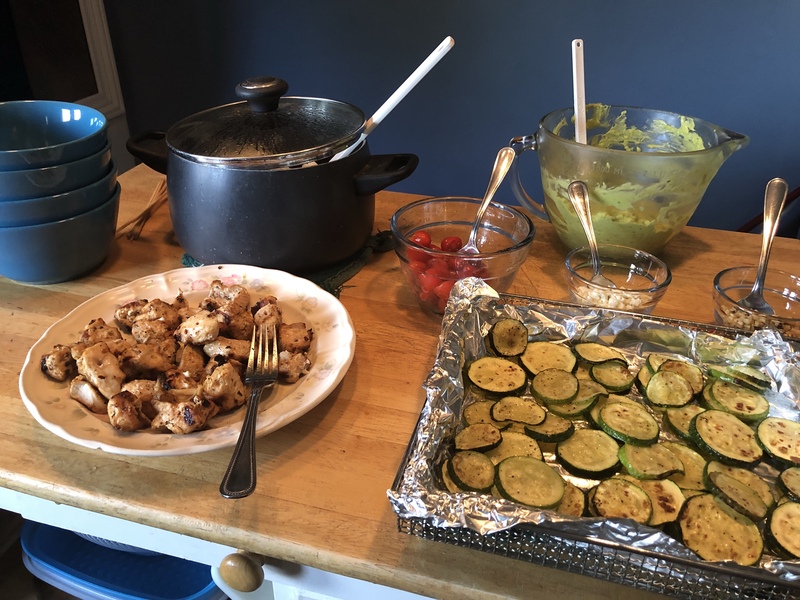 Well, you spend endless hours on Pinterest while calling suggestions to your family who are too busy watching You Tube videos and playing Song Pop to answer you, so you just choose the first recipe you pinned (Veggie Avocado Chicken Bowls) and pray that it’s a hit. I am just as surprised as you are…believe me. Especially since the theme of most of the California recipes (besides “avocado”) seemed to be “healthy”. And members of my family are not big fans of “healthy” food. I’m sure they were afraid I was going to pick one of the many recipes with “Tofu” in the title. I didn’t, of course (who likes tofu???? ), but I really didn’t think they would like Veggie Avocado Chicken Bowls, either. This recipe was somewhat of a twist on the Cuban beef bowls we got from Plated. Except there was no beef. And no pineapple. And it wasn’t Cuban. Anyhoo…Hubby and I went to the store for the ingredients. I hadn’t really read the recipe thoroughly at that point in time, which I was chastised by Hubby for. 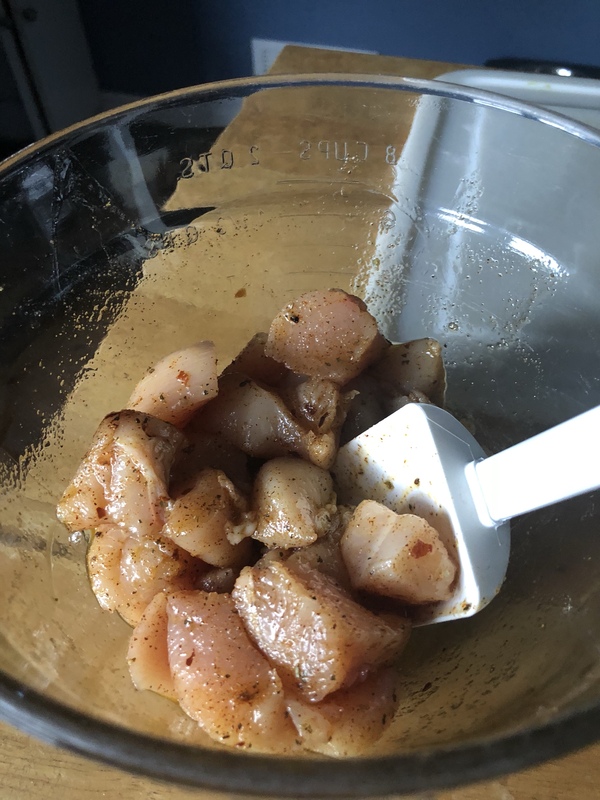 (Sometimes he studies recipes like there’s going to be a quiz or something…) So at that juncture, I had no idea what I was supposed to do with the chicken. When he asked me how I planned to make the chicken, I dismissed the thought with a wave of my hand and told him I would just grill it. Plain. Without seasoning. I thought I saw his brain explode. There are three things about me that Hubby cannot stand. #1. My inability to record checks properly and balance a checkbook. #2. My refusal to change a light bulb. #3. Lack of sufficient seasoning when I cook. He spent the entire ride home from the store making suggestions on how I might season the chicken. He disappeared for a few minutes after we got home (most likely because I was unpacking the groceries…ALONE…one of my pet peeves) and in that time I managed to read the recipe properly and season the chicken. Once he popped back into the kitchen and gathered his various herbs and spices in order to instruct me on my seasoning deficiency, I was able to smugly tell him that it was already done. While the chicken was marinating, I started the rice. You can use basmati or Jasmine rice. I opted for basmati rice—the few times I have made it in the past it has come out perfect. This time was no exception—yah, me! 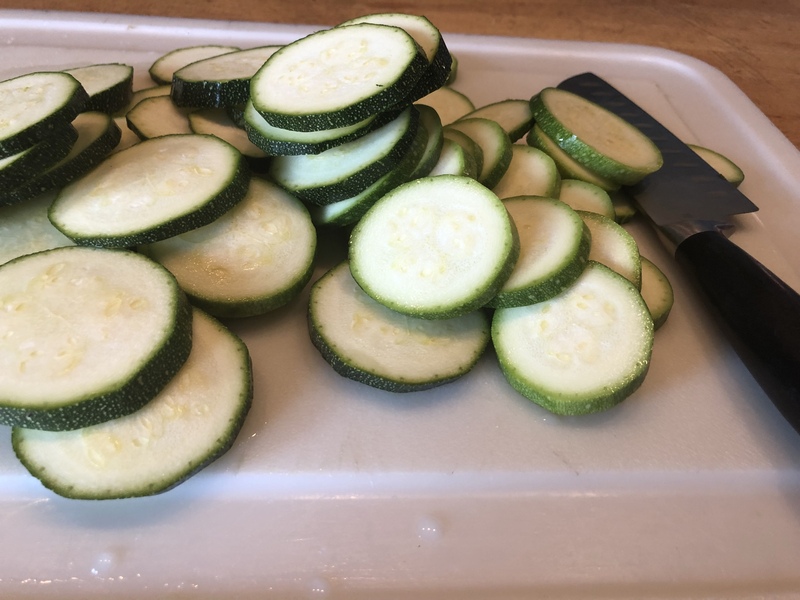 As the rice simmered on the stove, I cut the zucchini and prepared it for grilling. Meaning, I put it in a Ziploc baggie with olive oil and salt and pepper and shook it up. 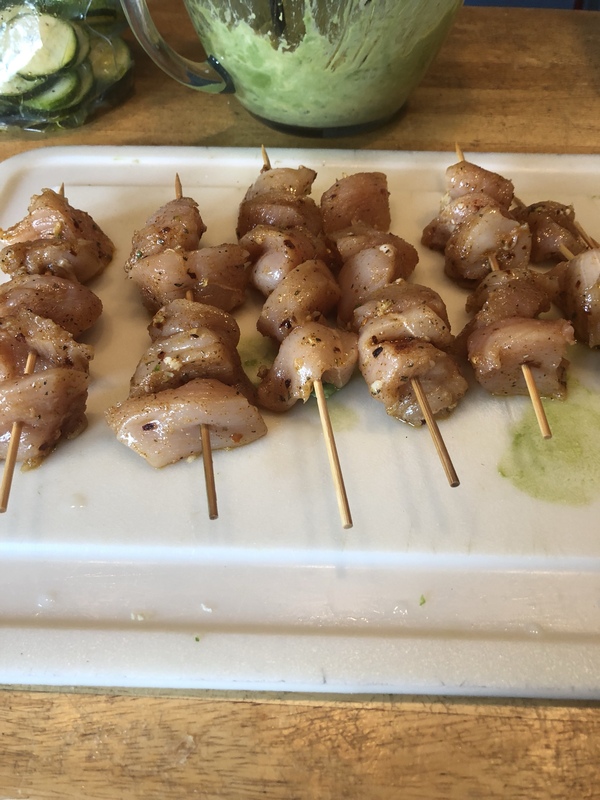 Unfortunately, the grill basket that I used took way too long to grill it (the chicken was done before the zucchini), so I got a chance to use the air fryer that had been neglected for the better part of two weeks. I also cut up the grape tomatoes…the recipe left them plain, but I tossed them in a little balsamic vinaigratte dressing. How’s that for seasoning things up, Hubs? I also skinned and mashed up the avocado at that time. This is also where I deviated from the recipe. 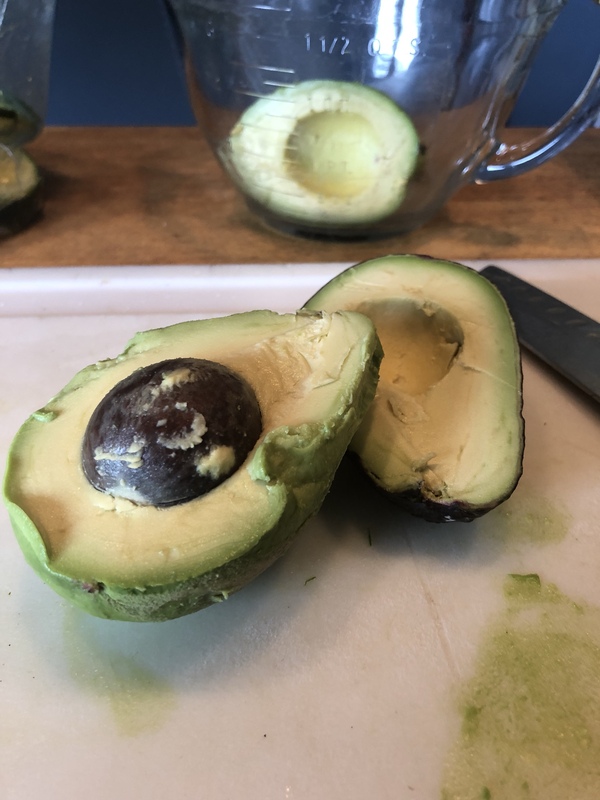 The recipe said to just add lemon juice to the avocado—I added lemon juice, lime juice, salt, pepper, onion powder, and garlic to make a quick and easy guacamole. Yeah, yeah, yeah…I know Hubby will interject hereto mention his guac is the best and his guac takes hours to prepare. And it probably is the best, but this wasn’t bad for a three minute guac whipped up at the last minute. The most difficult part of this whole meal was getting everything done at the same time, but eventually, we were ready to eat. I put out all the ingredients so everyone could assemble their own bowls. Oddly enough, the recipe calls for walnuts and blue cheese sprinkles for the top of the rice bowls. I laid them out, not sure if anyone would use them. It seemed like a weird combo. 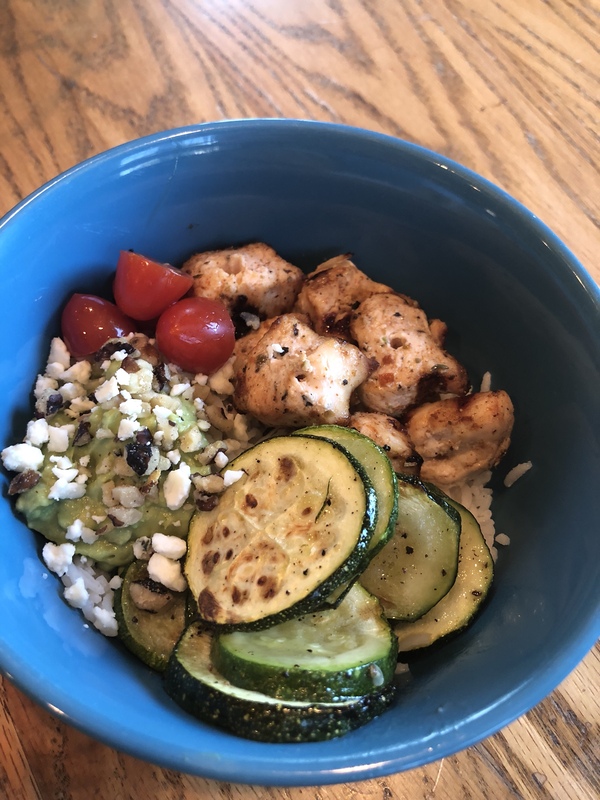 I highly recommend these California Veggie Avocado Chicken bowls. You can change up the veggie ingredients if you want, and I’m sure you could make it with beef or tofu (if that floats your boat). Bon Appetite!